Advancing gender equality and women’s economic empowerment through entrepreneurship in Southeast Asia are major goals of the Asia Women Impact Fund (AWIF), a 100 million USD gender-focused fund launched by the Sasakawa Peace Foundation (SPF) in 2017. 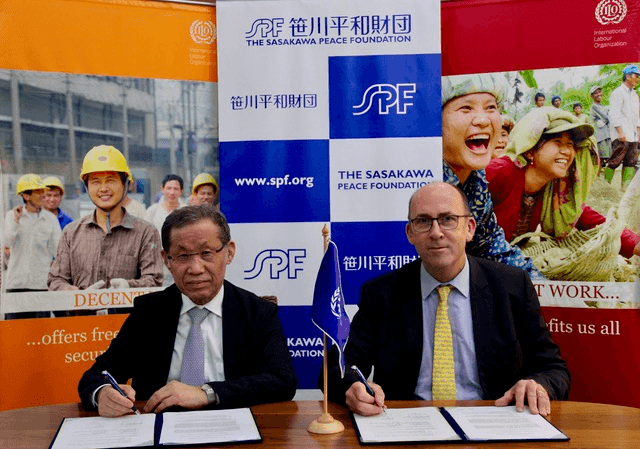 On November 19, 2018, Mr. Shuichi Ohno, President of SPF, and Mr. Rory Mungoven, Liaison Officer of the International Labour Organization (ILO) Myanmar, signed a memorandum of understanding (MOU) in Yangon to establish a partnership between the two institutions. The agreement outlines areas for future collaboration to promote gender equality and women’s entrepreneurship in Myanmar as part of a wider partnership in Southeast Asia through the AWIF. The MOU deepens the relationship between SPF and the ILO, building on a collaboration related to The Equal Pay International Coalition Pledging (click here for summary) event on gender equality in the workplace held at United Nations Headquarters in September 2018. Currently, SPF and the ILO are undertaking a national assessment of the policy and program environment for women entrepreneurs in Myanmar using the ILO’s dedicated Women’s Entrepreneurship Development (WED) framework and national assessment methodology. The assessment aims to understand the status of women entrepreneur development in Myanmar and identify targeted measures to improve the ecosystem for their success. A particular focus has been put on information communication technology (ICT) as a key enabler for women’s entrepreneurship development. In November 2018, SPF and the ILO dispatched a team of international researchers in coordination with the Yangon-based Socio-Economic & Gender Research Institute (SEGRI) to launch this project. The team’s research included interviews with key government, private and development sector representatives, as well as focus groups with women entrepreneurs to understand the current landscape and challenges faced by women-led and women-owned businesses in Myanmar. This project falls within SPF’s Gender Investment and Innovation Department. The findings and recommendations from the study will be available in 2019. The ILO is the only United Nations agency dedicated to the world of work. The main aims of the ILO are to promote rights at work, encourage decent employment opportunities, enhance social protection and strengthen dialogue on work-related issues, with a strong commitment to gender equality. Its unique tripartite structure brings together governments, employers and workers of 187 member states, to set labor standards, develop policies and devise programs promoting decent work for all women and men.